These are our amazing neighbors who became our wonderful friends in Montreal. The Fixman’s (Jeff, Randy, Matty, JJ and Sean) welcomed us when we moved into their neighborhood and treated us like family. We got to swim in their pool all summer, eat many dinners, talk about life, play, play, play! We will miss you so very much! We love you guys and will see you soon. Britt and Emerson, hitting the slopes! One of our last weekends in Montreal, was spent sledding with Britt. We had so much fun. We will miss you, buds! You are so fun. Thanks for being such an amazing friend to Em! We love you! and your family, too! 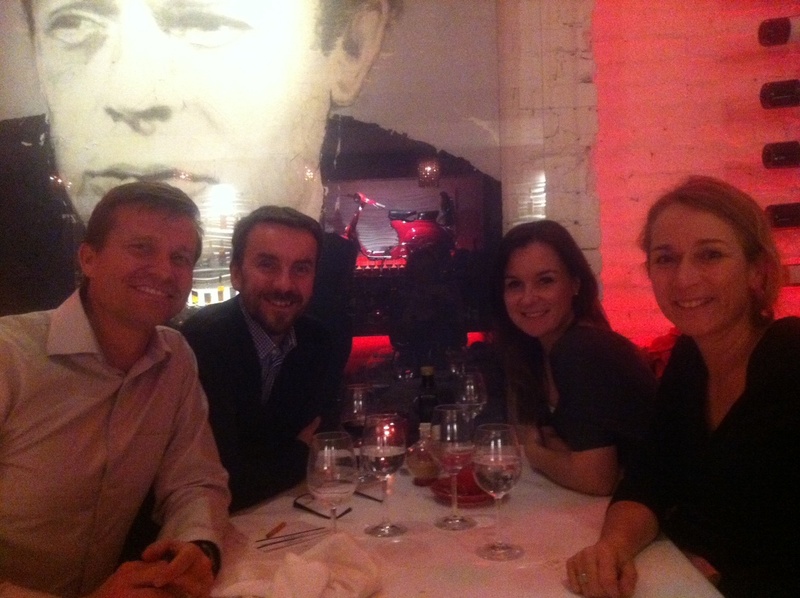 We went out to dinner one night with our good friends, Baerbel and John Huss. Little did they know they would be co-facilitating a couple’s therapy session for us. 🙂 They helped us come to the conclusion that we we both really wanted to travel the world with our kids. Their positive energy and amazing insight (they’ve been all over the world with their four kids) were so inspirational. We love you and thank you. Merci and vielen dank! We are pretty much packed up. 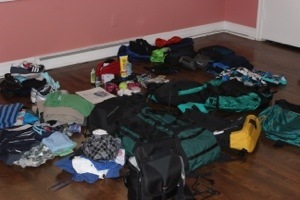 We have a few clothes, lots of bug spray, tons of meds so we don’t get sick….we are going to be traveling light!!! We will no longer be waking up in the morning wondering what to wear!